Do you love decorating you home with coastal decor or nautical decor items? Then adding one of this Whitewash Welcome FoFlor Mats by Fun Flooring is a great way to dress up your homes decor. Made right here in the USA this fun flooring mat is made for use in a variety of applications. Use it in the kitchen, bathroom, as a doormat or entry runner. You can place it anywhere you can image to use it. With it memory rubber backing this mat will always lay flat even and will not get creased. This washable and unique Whitewash Welcome FoFlor fun flooring mat is the perfect addition to any home in many different applications. 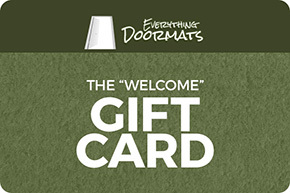 This particular mat only comes in the doormat size of 24" x 36" and features rounded corners. It is a great way to brighten up just about any room. (For more details about these unique FoFlor Doormats please see our Frequently Asked Questions Page.